As clan chief, spearhead mankind’s last stand in a blood-soaked action RPG. Take a closer look at the full range of features in Games Farm's forth-coming action RPG. Set amid the darkest winter in Norse mythology, Vikings: Wolves of Midgard invites you into a top-down action, role-playing saga, with customisable characters and weapons, brutal boss fights and full co-op support. Take on the role of a fearsome war-chief or a merciless shield-maiden in the Ulfung Clan – a notorious band of ostracised Viking warriors – and sharpen your blades for a fight to the death against the frost and fire giants of the marauding Jotan. Travel the underworld plains of Niflheim and Balheim and perfect your weapons skills before returning to Earth wielding terrible powers borrowed from the gods of Asgard themselves. Buddy up with a friend online or tackle the hordes as a lone wolf looting new weapons and armour to fortify yourself for fresh challenges in ‘New Game +’ mode. 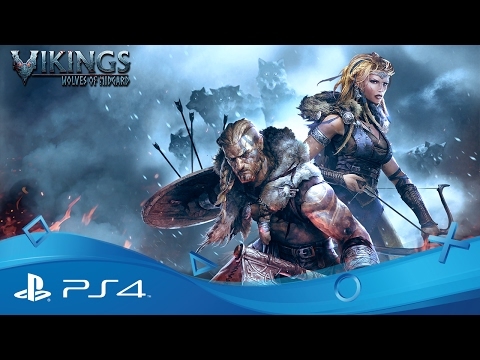 Buy Vikings: Wolves of Migard on PS4. Drive back the ice and fire giants of Norse mythology with a trusted friend at your side - all you need is PlayStation Plus. Launch into an intergalactic conflict against the enemies of humanity.